And now for my projects! I decided to color alice and make two different color themed cards but the same layout. I also used Flag Dies, Card Mat Dies, Scallop Circle Dies, Stitched Circle Dies and Goody Bag Dies. And for my other project.. 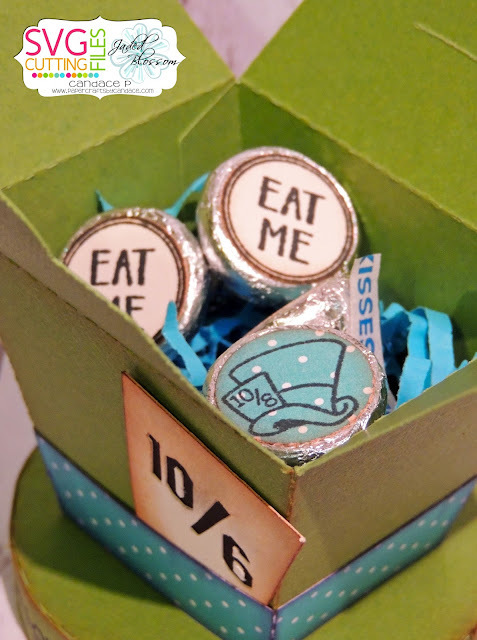 I made this mad hatter treat box from SVG Cutting Files!! 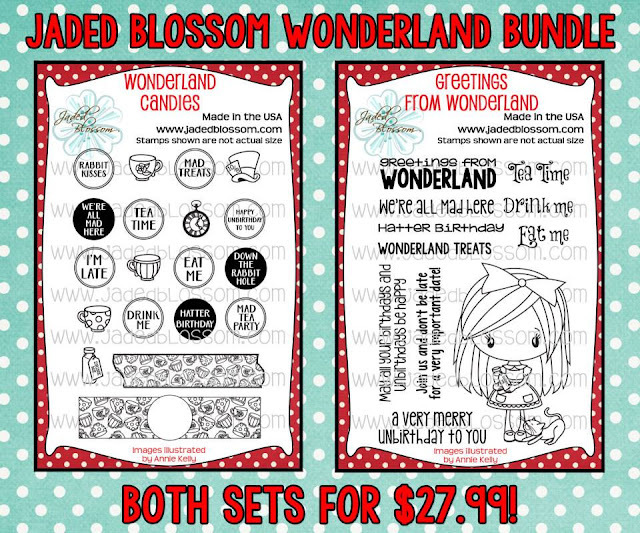 I used the new Wonderland Candies and Greetings from Wonderland for this project. I like the colorful Alice better but it was interesting seeing the different interpretations. Such a difference with the colouring. great job on painting. Love the hat! The treat box is super fun for all the candies with labels, Alice is my very favorite. I love it. Love the two color schemes for the Alice cards -- and the treat box is awesome!! Love the hat treat box! Great coloring! Great hat treat box, too! Those new stamps are awesome. Love how you did two versions of Alice a traditional and a monochromic one. Hi. The link to the map doesn't work,so I don't know where to start hopping. Can you help?? love the treat box - but also love how you colored the same stamp and made each look so different. I am so jealous of you coloring skills! All these projects are great! Love your cards and treat box. Absolutely wonderfully done. Love him! Might be a night to watch the movie. So So Cute! Mad Hatter Fun! great job on both color combos!! Mad Hatter is my favorite character and the hat box is adorable! Great job! AMAZING job on the coloring!!! What copic numbers did you use? Live the mad hatter box. wow love the 2 different colors cards! and that box is adorable! Wow both are wonderful but so different! I love the cute little hatter box! WOW what a difference the coloring makes on the cards! They're both terrific. love your projects. Thank you for sharing. Have a great crafty day. These are great! Love the Mad Hatter box! both cards turned out great. The hatter box is so fun. Both color schemes for Alice are great, and the Mad Hatter Hat treat box is so fun! Love the two cards with the same layout in different color schemes. So pretty. And the Mad Hatter treat box is so fab. Loved seeing this in two different colors. This is my first blog hop. My husband saw the theme and has already started planning an Alice themed birthday party for our three year old. Love all the new stamps. And that treat box is the bomb! Love the hat, too cute! So fabulous! I can't wait to make that hat treat box! Super fun projects. They look great. Thanks for sharing. Your projects are amazing. I love them! Excellent job with the hat! great cards, it's amazing the difference the colors make, even though they are the same card, they look totally different! Super cute treat box! Wow, you guys blew it out of the park with such a great hop! Fantastic inspiration!! Great coloring!! 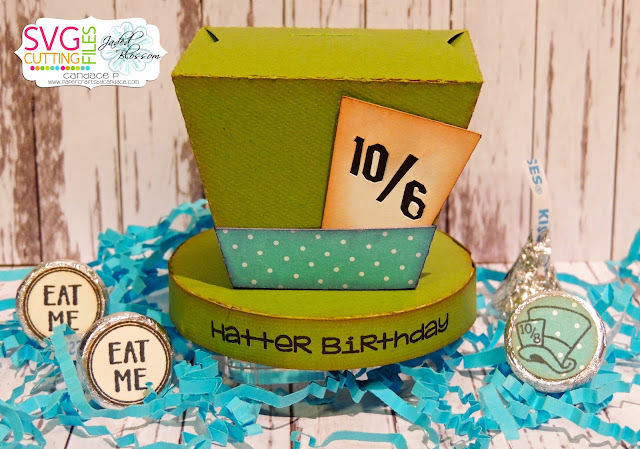 Love both cards and the mad hatter treat box is adorable! LOVE your cards! I love how coloring makes stamps so versatile!! Cards look great, love the mad hatter treat box, gonna have to get it! As I said on my previous stop down the rabbit hole .. with each stop I fall more in love with the stamps and files .. what I would do with them I don't know .. but thank you so much for all the inspiration! You all are awesome! Seriously fantastic! You coloring is amazing!! Beautiful coloring on your cards. Love the hat. It would make a great ceneterpiece. So so cute, thank you! Love the hat candy box! Love the colored Alice. So cute! soooo adorable! thank you for sharing! WONDER-ful job on your projects! I really though the black and white Alice card was intriguing. Love all the projects and got some great ideas. Love it! So cute, thanks for the chance! Wonderful! Really love the treat box. That Mad Hatter Hat is awesome! 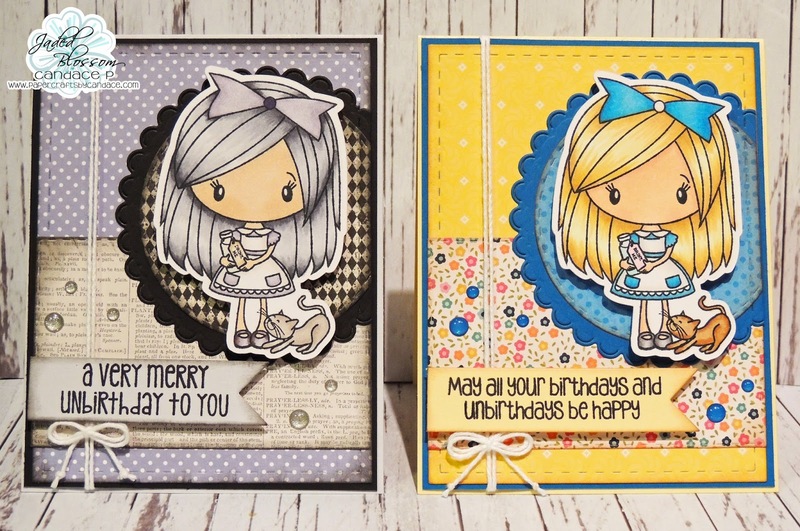 Love how you made two Alice cards but in different color schemes, they both came out adorable. The Hatter hat is too cute. amazing the difference that just a different color scheme makes! These are all so cute. Love the contrast between the two Alice cards. Love your Alice cards and hat! wow! Those cards are so different! LOVE that Alice stamp set. CUTE projects. HAve a blast on the HOP. First time doing a blog hop...it was fun seeing all the creativity out there. way too cute. love the box and alice coloring. Thanks for another great hop!! Mad Hatter is great! Can also be made for a centerpiece. Love the colouring on your cards! You do an AWESOME job. Great projects. Love them all. I LOVE Alice in Wonderland!!!!! These projects are great!! Thanks for sharing!!!! Both your cards are beautiful & there is such an amazing difference in them by just changing the colors. I really am digging your Mad Hatter Yum, Yum. 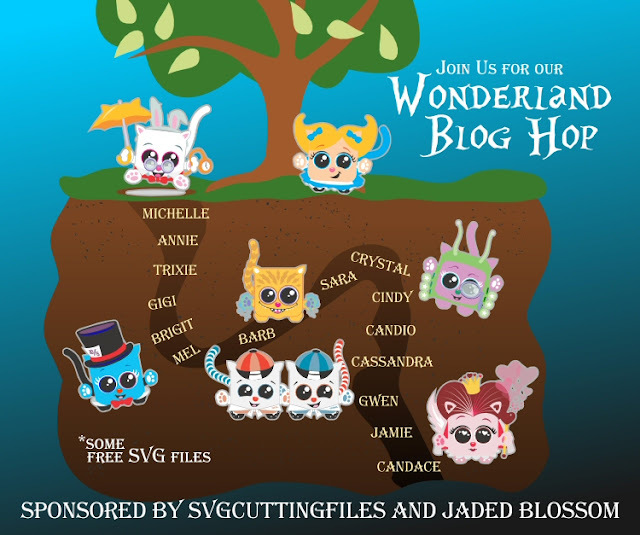 Such a great blog hop with awesome SVG's. Such a difference when you changes the colors. Beautiful!! Very fun hop. Thanks so much for the inspiration. This bloghop has been a blast! Your projects are so cute! TFS!! Thank you for another amazing crop!!! What cute projects! Love them! Look at the Mad Hatter box! I love it! Way to put a spin on Alice. I like both versions of them. Another amazing hop as usual. such a great job!! I love both !